Gretel and I recently had the privilege of attending the Nestlé Purina Better with Pets Summit in New York City. This Summit is where they bring together some of the greatest minds to discuss how pets make our lives better and how we can improve the lives of our pets. As she frequently does, Gretel blew me away with how well she handled all that New York City threw at her. It’s hard to believe she was on Prozac for her anxiety when we adopted her in 2010. This trip was only the second time I’d flown with Gretel (or any dog). To refresh my memory, I reviewed the lessons I learned about flying with a dog article I wrote the last time we took a plane ride together. Except for a few very short stints a few days before our flight, Gretel hadn’t been in her Sleepypod Air carrier for a year and a half. It would have been best to spend at least a few weeks increasing her time in the carrier to get her used to it again but I didn’t have time. She made me so proud because she hopped right in there and was fine inside for the whole trip. As with the last time we flew together, I was way more anxious than she was. I paid for an additional night at the hotel so we could extend our trip a little. I at least wanted to see Central Park and the 911 Memorial . On our first full day in New York, we hopped in a cab for our first New York City traffic experience and headed across Manhattan to meet up with a dog walker. I had no problem getting right in the cab with Gretel without a dog carrier but I did tell him that I would hold her on my lap instead of letting her on his seat. 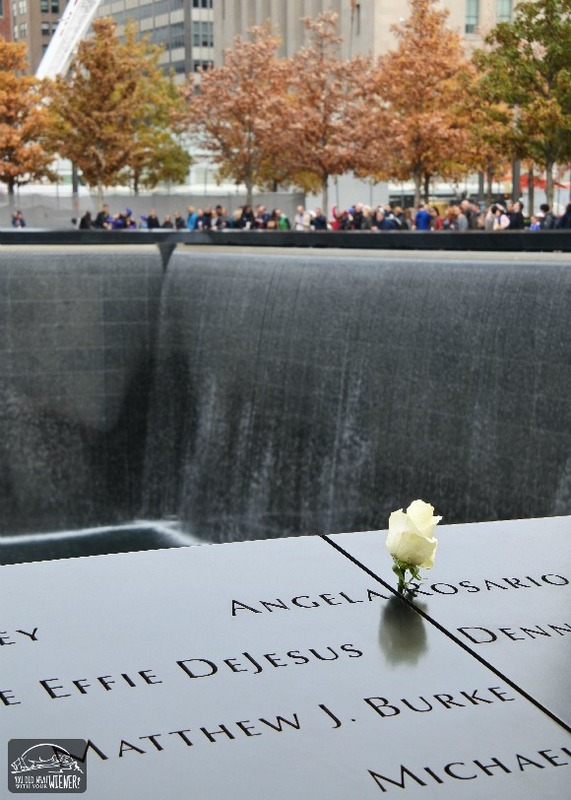 I dogs are not allowed at the 911 Memorial. Not even on the monument grounds. 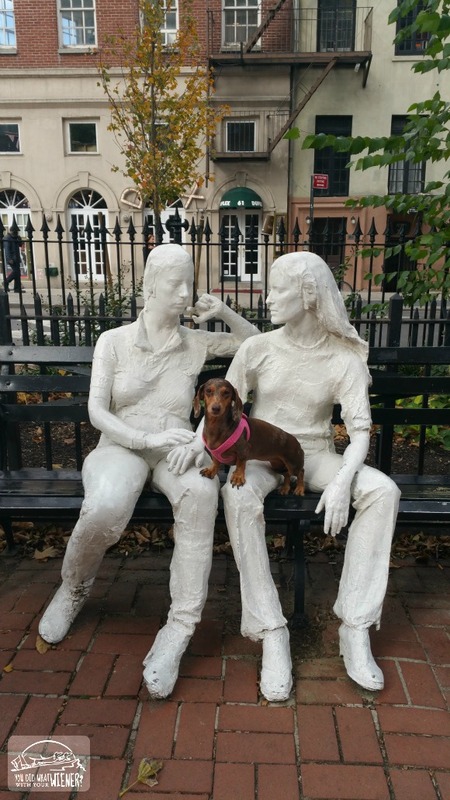 A couple of weeks before we left for our trip, I contacted Good Dog Walking and arranged for them to walk Gretel for an hour while I visited the monument. The folks at Good Dog Walking suggested they meet me at a subway stop on the way to the Monument but I was running late so I took a cab. Not knowing the City, I thought the the meeting location was within walking distance to the monument. Wrong. After a 3 minute verbal crash course from them on using the New York subway, I was screeching toward the monument on an underground train. I was stressed from the rushed morning in a totally new environment. I am sure Gretel was a little stressed because I left her with a stranger in a bustling City. 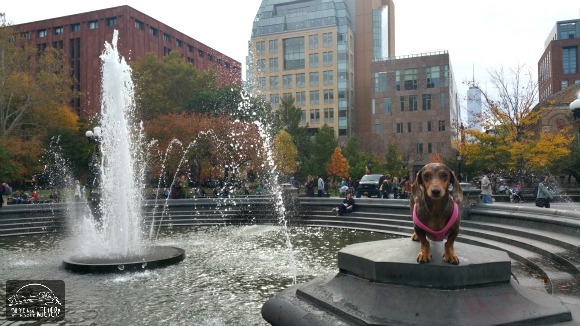 I thought both of us needed a calm break so we headed up to Washington Square Park. After Gretel and I walked around the park and sat on a bench for a bit, Gretel got her first subway experience. After my single nail biting, confusing-to-navigate subway trip that morning, I felt like an expert. I confidently boarded the subway with Gretel, checked the overhead map for our stop, and got off the subway at the station right down the block from our hotel. So I thought anyway. It turns out that we were on a subway line that traveled in the direction of our hotel but the stop was about 10 blocks northwest of where we needed to be. We navigated the crowded sidewalks again (Gretel did amazingly well with all of the people) and headed toward the hotel. I spotted Times Square as we were crossing a street so we took a detour to check it off our list of things to see. I heard it was crazy busy there and I would have to be very careful with Gretel so people didn’t step on her. It wasn’t that bad though – probably because it was late afternoon on a Monday. We sat in the middle of Times Square on a bench for about 10 minutes just watching people. There were a couple of those people in costume I’d heard about that stand around like statues, and let you take pictures with them, for money. We’d had enough so I scooped up Gretel and started to head back to the hotel. But then I had an idea. We needed something to say we had been there and Gretel with neon signs in the background wasn’t very exciting… so I had an idea and got brave. 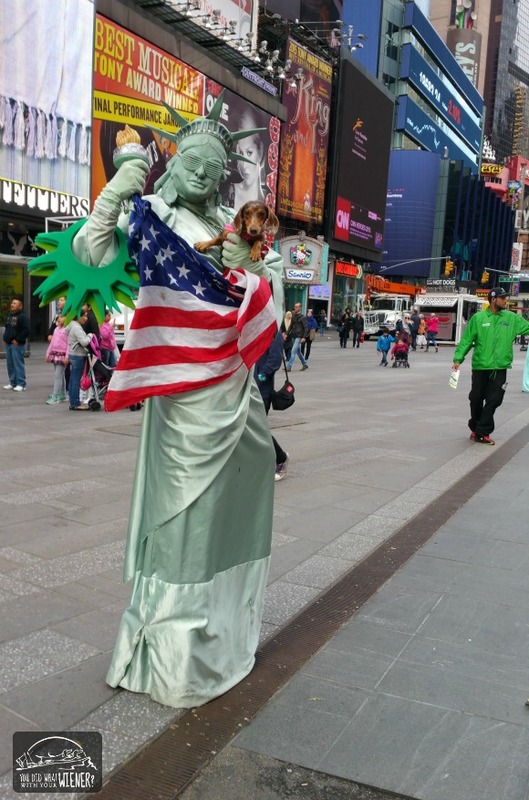 I asked one of the Statue of Liberty people if hey would mind holding my dog for a picture. I seriously could have gone home after getting this picture and been satisfied. Ha, ha. After that, we walked back to the hotel, hopped in a cab, and ate dinner at the dog friendly restaurant The District with a friend. The District staff were very friendly and the restaurant had a heated outdoor patio. 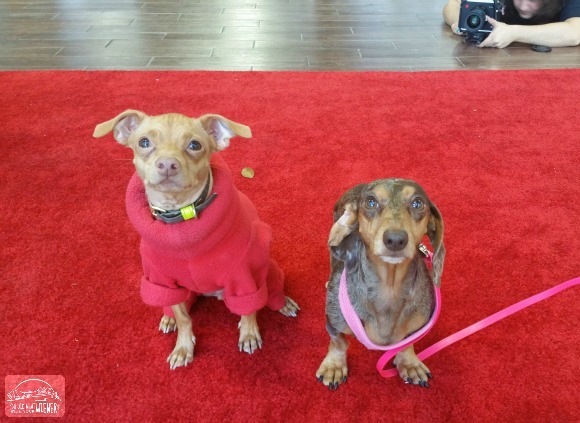 The next morning we were shuttled to the Better with Pets Summit… where we got to meet the Instagram famous Tuna from @TunaMeltsMyHeart. The Better with Pets Summit was pretty amazing. It’s an invitation-only event and I was honored that Nestlé-Purina asked me to attend. I listened to leading experts share some of the latest information about emotional wellness and the evolution of the bond between pets and the people who love them. We also heard about how sled dogs revived the vitality and culture if a little Alaskan Village, how Millennials are changing our relationship with cats for the better, how to manage your pet’s stress to enhance their well-being, and how pets help children grow and thrive. We were pooped after a full day of learning and schmoozing but we couldn’t sit still at the hotel. We still had more New York City sights to check of our list so we walked a few blocks to Grand Central Station. Honestly, It wasn’t as exciting as I had imagined it would be but I got a great little history tour from a fellow pet-industry gal who grew up in Manhattan. 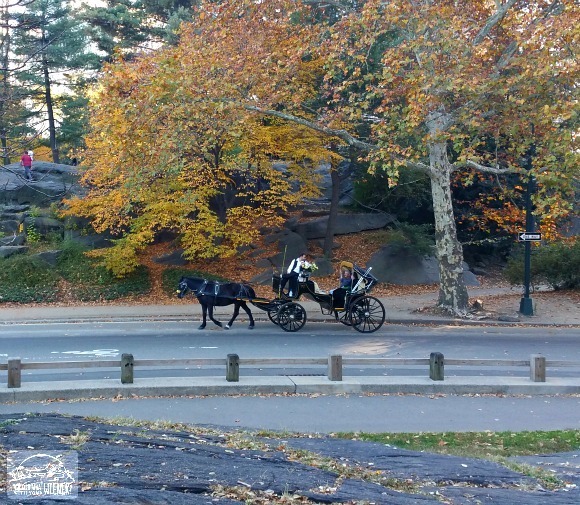 The next morning we checked out of the hotel and made the 15 minute trek to Central Park. The plan was to spend 5 or 6 hours there exploring until we had to go to the airport. 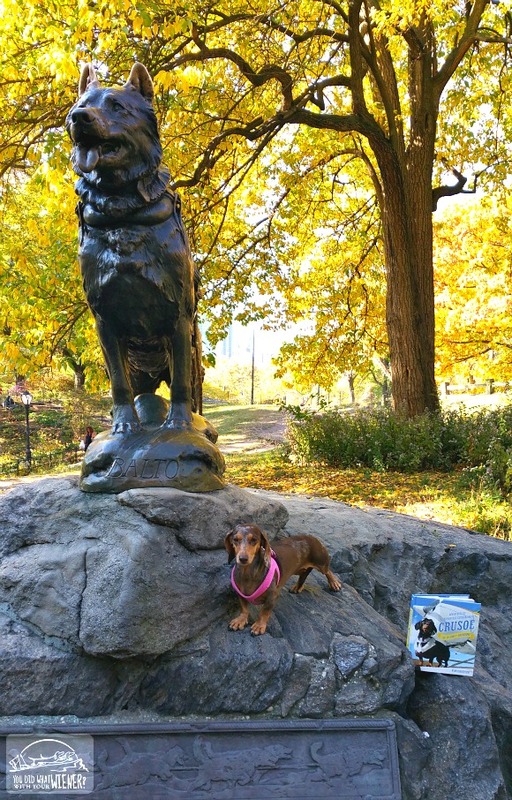 The first place we stopped was the Balto statue to take a picture with our adventuring friend Crusoe the Celebrity Dachshund (well, his book anyway – affiliate link). Balto was a Siberian husky sled dog who led his team on the final leg of the 1,925 serum run to Nome, Alaska in which diphtheria antitoxin was transported from Anchorage to Nenana by train, and then to Nome by dog sled, to combat an outbreak of the disease. The run is commemorated by the annual Iditarod Trail Sled Dog Race. We briskly walked about 3/4 of the park. We didn’t make it to the North Woods but we did see Belvedere Castle and stumbled upon a few beautiful views like this. Before we ran out of time, I asked our Instagram friends if there was a landmark in the park that we must see. They suggested this. 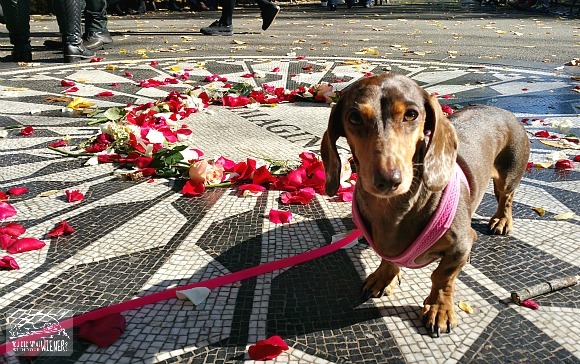 It’s clear that people come from all over the country, and probably world, to see this tribute to John Lennon at Central Park’s Strawberry Fields. We had to wait for about 15 minutes before I could get this photo of Gretel. People seriously pushed us out of the way to get their perfect mural shot. Not very in line with the peaceful purpose of the memorial if you ask me but whatever. People lined the surrounding benches while guitar-strumming musicians sang their version of the John Lennon classic Imagine. After about 5 miles of hiking around Central Park we were hungry. 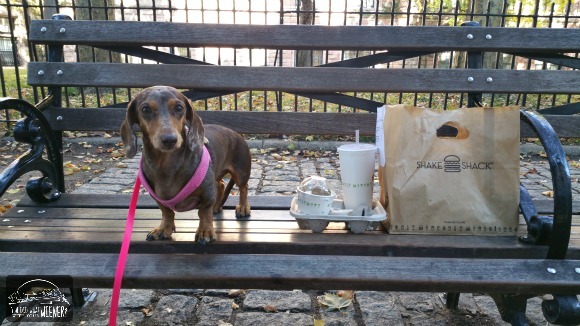 I did a lot of research about dog friendly restaurants in New York before we left and several articles said the Shake Shack by the park was a must. We arrived to find that dog friendly meant a few doggie items on the menu but no outdoor seating and a hitch to tie your dog up outside. I was NOT going to leave Gretel tied to a hitch on some New York street corner. I scooped her up, smiled nice at the door attendant, explained that I had clearly read that this restaurant was dog-friendly, and he let me place my order quickly with her in my arms (you’re totally not allowed to have dogs inside but the door attendant took mercy on me). I waited just outside the door until our order was called, ducked inside to get it, and then walked across the street to eat on a bench. 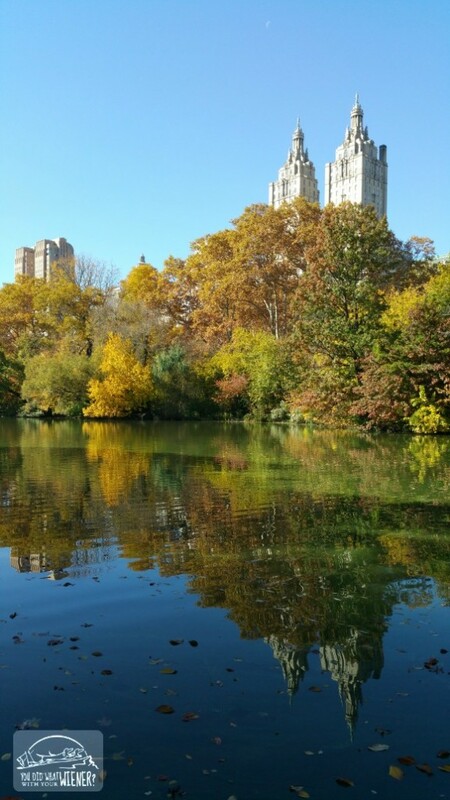 We spent our last half hour in Central Park sitting on a rock and watching the world go by. 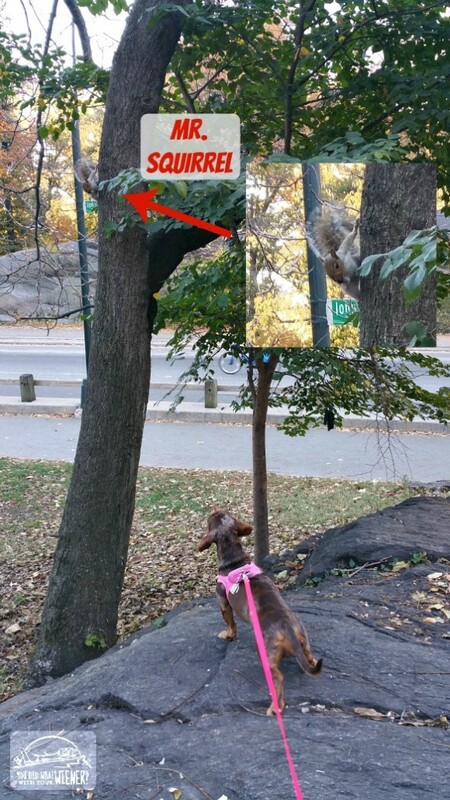 Gretel got teased by Mr. Squirrel a lot as I watched the carriage horses. So that was all we were able to see in Manhattan in 3 1/2 days. Honestly, it was scarier and more nerve wracking than any hike we’ve done. 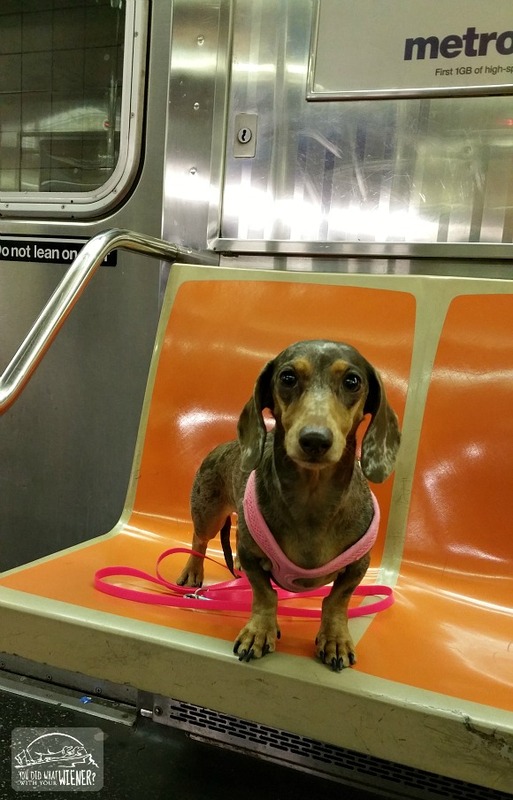 Being from Seattle, I am no city newbie but New York is so crowded that I always had to be on high alert walking Gretel. The incessant honking of traffic was unnerving too. People are generally too polite to honk in Seattle so it’s not something I am used to. At least it’s checked off my list now. I hear New York City is a spectacle you should see at least once. We did. I’m not sure if we will ever be back. Disclosure: Purina paid for our air travel and hotel to New York City to attend the #BetterWithPets Summit. I paid for an extra night at the hotel so Gretel and I could spend a little more time exploring the City. Everything I may say about the Better with Pets summit is true – It was amazing! – and Purina is not responsible for the contents of this article. I can’t wait to see you, because I have so many questions about New York and the Summit. It looks like Gretel enjoyed herself. Zoey is so anxious that she’d be miserable on a trip like this; has the hiking helped to increase Gretel’s confidence and alleviate her anxiety? What a great adventure. Love the photo – it is priceless! What a fun way he has found to make a living in New York City. Love that last picture. Sounds like you had a fun adventure! That last photo is definitely priceless! So glad you had a good time. I look forward to the next post. I’ve never been to NYC, but Mom has many times and says it’s a real different animal. 1-2 days is all she can take, but it is a place everyone should visit at least once in their lifetime. I love reading your blogs. I have a dachshund and I can’t imagine her doing some of the things your dogs do. Keep blogging. Thanks,. We appreciate you following along with our journeys. Sounds like a great trip! Gretel is clearly an amazing traveler, I don’t think I’d have taken my digs to Times Square! Its a crazy area, I can barely navigate the crowds there myself LOL! Love that last photo w/ the statue of liberty, it really is priceless! Times Square wasn’t as crowded as people made it seem. I did carry her when we were leaving though. It’s just quicker and I can 100% not worry about her getting stepped on. Aw, I’m sad I didn’t see you! I’m a New Yorker and fan of your blog. Next time you’re in the city, post on when you’re going to Washington Square Park if you’d like to meet some fans! Ha, ha. I know what you mean. I have Gretel trained (pretty much anyway) to sit in one spot but she will half close her eyes like I am boring her. I am actually working on a “look” command where she must look at me with her eyes open to get a treat. She is super food motivated so that’s not so difficult. The key for me is to use a large treat that she can clearly see (like a big piece of k jerky) but that allows me to bread off tiny pieces to give her.